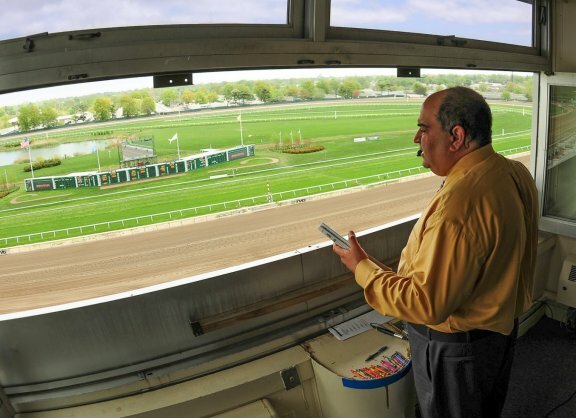 With the GI Betfair.com Haskell Invitational right around the corner, TDN’s Steve Sherack caught up with track announcer Frank Mirahmadi as he prepares to call Sunday’s action. The voice of Monmouth Park discusses some of his favorite local pizza spots on the Jersey Shore, throwing out the first pitch at a minor league baseball game, being a part of American Pharoah’s entourage and plenty more. Q: Followers of your Twitter account @FrankMirahmadi have become quite familiar with your popular #pizzatoursummer2016 Tweets since the Monmouth meeting kicked off in mid-May. Tell us a little bit about it. A: I have very unique eating habits. I’m a vegetarian–I don’t eat meat, chicken or fish–and I really don’t eat a whole lot of vegetables, either. I’ve been basically a pizzaholic my whole life since I was a little kid. I only eat plain cheese pizza–I actually prefer light cheese–and my favorite is Sicilian style. Growing up in L.A., there’s only been a handful of places I could ever go to and I’ve always heard about New York pizza. I visited New York in 1989 and I had a chance to go to some of the great pizza places like John’s on Bleecker St. So when I came out here last year in my first year as the announcer at Monmouth, I was excited that I was going to have an opportunity to try a bunch of different pizza places. I went to some, but I didn’t go to enough. This year, I’ve made a strong effort to get to as many places as possible and it’s been a lot of fun. It’s been very well-received, too. I don’t post bad reviews. There are some that I really think are rather poor that other people have recommended, but I rather just focus on the positives. Q: Where have been some of your favorite spots so far? Any recommendations for people to check out while they’re in town for the Haskell? in Freehold. They started in Brooklyn, but now have a few locations in New Jersey. I recently tried Rockafeller’s (http://www.rockafellerspizza.com/), a neighborhood spot a few minutes from Monmouth in Long Branch. It’s tremendous. To me the best thin pizza that I’ve had of all them is a place called Spirito’s (http://www.spiritositaliandiner.com/) in Elizabeth. When you walk in there, you’d think it’s opening day in 1935–nothing has changed. If people are looking for a nice restaurant, I’d suggest Jimmy’s in Asbury Park (http://www.jimmysitalianrestaurant.com/). Q: Any special meal or destination planned for post-Haskell? A: Nunzio’s in Long Branch is a place I really like quite a bit and have many dinners there. It’s a great spot–they’re super people and they make great pizza. I think I’d have to include Nunzio’s as one of my favorite spots as well. I may go to our new restaurant at the track, Blu Grotto, after the races. It’s really great. Q: Now in your second full year as Monmouth Park’s track announcer, what’s your experience been like so far? A: I absolutely love it here at Monmouth Park. When I interviewed for the job, I met with people that have been here for a long time–Bob Kulina, Dennis Drazin, Bill Knauf–and they’re very passionate. I’ve also known John Heims for 20 years–he was at Hialeah as a kid working for publicity when I was the announcer there. I felt very comfortable with the people here and I felt that their passion was evident. To me, it meant a lot that a place that takes their racing so seriously wanted me to come. I pretty much decided in the first 10 minutes when I met with Bill Knauf, even before I met Bob Kulina and the other guys, that I knew I wanted to work for him. I could just tell. Being here is great. It’s better than I even thought it would be. It’s a beautiful track, it really is. I love the fact that I can open the windows in the announcer’s booth and get the breeze coming in. It’s a very laid back press box. I just love the people here and the racing is great. Q: Biggest challenge of calling the races at Monmouth? A: There’s one small element that’s difficult for me. The booth is located midway between the sixteenth pole and the finish line. I can’t call close photos–it’s absolutely impossible for me. The people on tv can see it better than I can, so I can’t take that chance. I love to call close photos, but the flip side of that is by being where I am, I think it gives me a chance by being closer to the real action of what’s happening in the stretch that actually helps give me better calls. It’s kind of a trade off. I can really see things developing better from that vantage point than if I was at the finish line. Q: More nervous calling your first Haskell or throwing out the first pitch at the Lakewood BlueClaws (Single A Philadelphia Phillies minor league affiliate) game? A: That’s funny because they were both pretty nerve wracking. The big races, the pressure, you just feel it. I’ve done this for a long time now, but still when the big race comes up, you get those feelings of butterflies, especially with American Pharoah coming here last year. I was very happy with the way it went. The first pitch for the BlueClaws last year–I hadn’t thrown a baseball probably since seventh or eighth grade. So I went out there and I said, ‘Alright, no big deal.’ I didn’t have any practice throws whatsoever. I took the ball and was walking to the mound and the guy says, ‘Show us what you got.’ I’m a big baseball fan–I absolutely love baseball–and figured I’d just come with the heat. And I threw what had to be one of the worst pitches of all time. An all star wouldn’t have stopped that ball! This year, I had a chance at redemption. The morning of the game I threw about 30 pitches. Then when I went there it was great. I thought I was going to throw out the first pitch again. But before me they had an 8-year-old, a priest, a lady who was a principal teacher, and a West Virginia Mountaineer guy with a gun in one hand–and every one of them threw great pitches! I looked at [Monmouth’s] Brian Skirka and said, ‘You got to be kidding me.’ The best pitch by far was the 8-year-old–he had a beautiful wind-up and threw a perfect strike. Then I go out there. I throw it and thank goodness, the catcher caught it. It was high and away. It was a lot of fun. Q: In addition to calling American Pharoah’s Haskell and his blowout wins at Oaklawn in the Rebel and Arkansas Derby, you also got to spend some time at the races with his connections during his unforgettable Triple Crown run. Have you had time to reflect on that experience yet? A: When American Pharoah came to the Rebel, the Zayats came to Oaklawn for the first time. That, to me, was the first indication of how special he might be. Just the fact that they showed up and weren’t there for [2012 Arkansas Derby winner] Bodemeister. His Arkansas Derby performance was so amazing. It was just something special to watch. There are moments that become defining moments and important moments in one’s career and in one’s life. And that race, I had never seen a performance so spectacular. And I called Tiznow’s Super Derby win when he shattered the track record and I called him a superstar in the making. I knew with the Pharoah, I had seen something better. The guy who I work very closely with at Oaklawn in publicity– there’s a publicity office right next to the booth–was just banging on the glass right after the race. It was something I’ll always remember. I got a text from Mr. Zayat telling me that he cried listening to the race call and Bob Baffert left me a message that I still have on my voice mail. I got an email from Trevor Denman a couple of days later, and I also received a text from Tom Durkin. I was so grateful that it went well because when the adrenaline is flowing–and I had certainly thought about things to say for him–you don’t know exactly which words you’re going to use. That experience was absolutely amazing, then Mr. Zayat texted me and said, ‘You better come to the Derby.’ I hung out with them the entire week, then I photo bombed him in the winner’s circle by accident! It was somewhat surreal to live through. After he won the Triple Crown, it was so logical for him to come to the Haskell and it was certainly great to see him and have Monmouth Park get the much-deserved boost. It was a great turnout and thankfully he did what he was supposed to do. 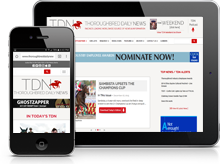 Q: How did you become interested in horse racing? A: My dad used to like to go the races. And we would go as a family. It became an event for me and my brother and my mom and dad at a young age. By the time I was eight or nine I was absolutely fully into it. When I was nine years old in 1977 I was devastated that my dad wouldn’t take me to watch Seattle Slew in the Swaps. I just loved it and then I started becoming fascinated with the announcers. We had some great ones in California and I started imitating them at a young age. Q: How would you describe your announcing style? A: I try to keep my announcing very simple. I would say that certainly Trevor Denman is my idol in racecalling and I’ve tried to emulate the way in which he calls the race, which is to keep it simple, but also keep you posted on things that are developing. I feel like I read a race well and I try my best to describe it instantly without expressing too much opinion and that’s a very fine line. No one wants to hear opinions, particularly when they’re wrong. I try my best to avoid filler words to buy time, too. I find that very difficult to listen to. I like announcers that give you the names of the horses as soon as possible without expressions such as toward the inside, moving up the rail is, etc. I just try to keep it simple, accurate and exciting when necessary. Q: How much preparation goes into calling a day’s races? A: I don’t really dig deep into the Form on every single race. Certainly I look at the Form, but I don’t try to predict exactly how the race is going to unfold. I try to be objective instead of thinking so and so should be to the front. One could argue that it’s better to be more prepared. Tom Durkin would have it to where he had everything in his mind exactly the way everything was going to develop. I need to try my best not to do that. I try to just let the race tell the story because that way I’m not biased toward what I think should happen. But I’m certainly open to the idea that maybe I don’t have the right philosophy. It’s just the way I do it. I don’t like to overanalyze it beforehand. When the horses come out on the track, I color the silks into my program. I do it right then, not beforehand. I’m no artist, but I just scribble the silks in there. The process of that–just like when we were kids in school–you write something down and you have a better chance of remembering it. The very process of just coloring in a certain thing helps you remember who that horse is. Q: Let’s talk Haskell a little bit. The top three from the Derby, headed by champion Nyquist, are all on board. Thoughts on the race? A: I called Nyquist’s San Vicente during my audition at Santa Anita and he was a beast that day. I was shocked that Exaggerator was ever able to beat him. In fact, I told people after the San Vicente that Exaggerator’s heart was left on the racetrack because he fired such a big shot and couldn’t get by him. I don’t think they can beat Nyquist Sunday, I really don’t. He’s such a good horse and he’s got that speed, too. I think everyone’s in for a long day trying to beat him. Gun Runner is very talented. I just feel like Nyquist is probably in a little bit of a different league. But that’s why they run the race, right?